Posted March 29, 2018 by Riley Hooper & filed under Arts & Entertainment, Movies. A nostalgic trip for the older generations with an overload of pop culture references. 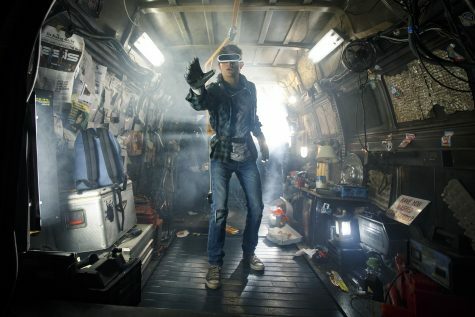 Ready Player One was a visual adventure crossing between the troublesome real world and the ever-changing virtual world. The first half showed real promise but diminished towards the end. An entertaining watch, but missing a little something that would have made it extraordinary. Following the death of the virtual reality world creator of OASIS, a virtual world where players can literally do anything, a video is released on the platform challenging the players to complete three missions to claim the Easter Egg that will give the winner the ownership of OASIS. Ready Player One stars Tye Sheridan, Olivia Cooke, Ben Mendelsohn, Simon Pegg and T.J Miller to name a few. Directed and produced by Steven Spielberg the film was written by Zak Penn and Ernest Cline, based on the book of the same name written by Cline.